Since moving to Slippery Rock, Bob McCafferty initiated the first meeting of The Slippery Rock Business Association, opened North Country Brewing Co. and started a shuttle service for hikers who are day hiking from the Old Stone House to Moraine State Park. He also organized mail drops at the Post Office for through hikers of the North Country Trail and resurrected the Rock Chapter of the North Country Trail Association. He is a member of Slipper Rock Development, a group that spearheaded redevelopment of Main Street and Franklin Street. 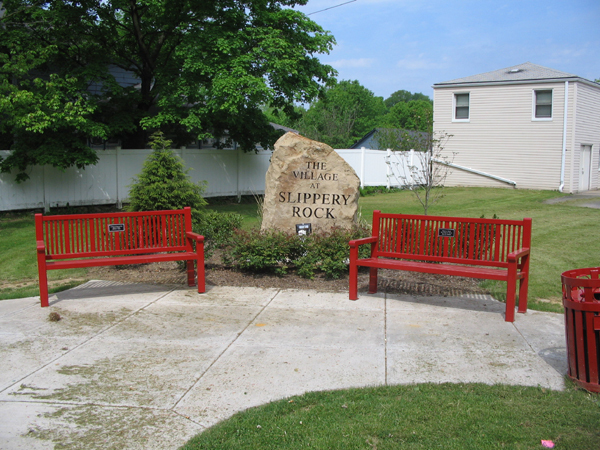 Furthermore, he started ‘Polish the Rock’, a monthly cleaning, mulching and drain clearing of downtown Slippery Rock. Donate a small amount of your time to help keep our town clean. For more information contact Tom McPherson at 724-794-2338. You can make a difference by making a cash donation to the Slippery Rock Development Fund. and other areas that will improve the overall quality of life & sense of community. With over 85 businesses in the Slippery Rock Business Association, the SRBA is the perfect way for your business to network in the Slippery Rock area. It is involved with many aspects of the community and offers an affordable solution to get your business noticed. Are you interested in opening a business in the Slippery Rock area? Do you have a Business Opportunity for someone in the Slippery Rock area? Call Tom McPherson at 724-794-2338 to get your information posted.